The RED LINE also shows what has happened to the CAPITAL ACCOUNT in the Balance of Payments. The Capital Account has been in consistent SURPLUS both because the Rest of the World demands U.S. Dollars in the form of U.S. Treasury bonds, but also because foreign nationals need to buy real estate and build factories in a country where the government does not confiscate wealth and infringe liberty as much as in, e.g., China. 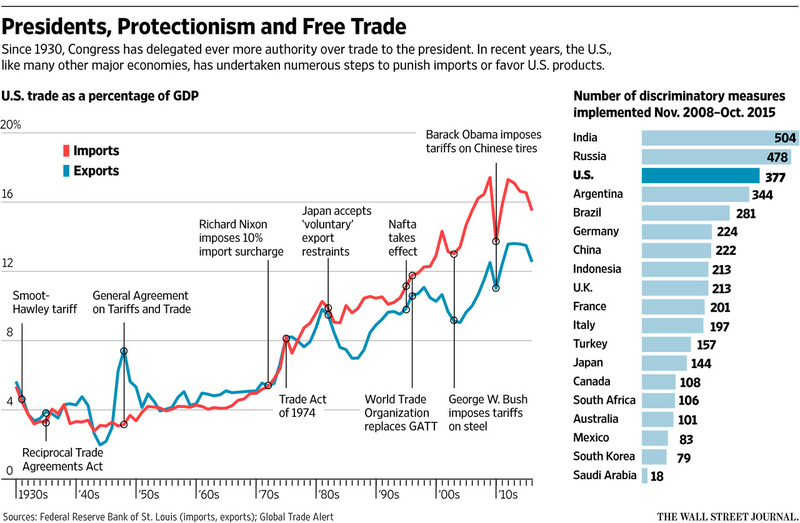 The graph on the left side begins with the Smoot-Hawley Tariff of 1929-30. The stock market crash happened when the House of Representatives passed the bill in October 1929 and the Great Depression began (after a stock market recovery) the following spring of 1930 when the Senate passed and President Hoover signed the Tariff Act, dramatically increasing the tax Americans had to pay for anything imported. Since the Rest of the World, particularly Europe, in 1930, could not so easily sell goods to Americans (who had to pay the tariff-tax on imports), they stopped buying large volumes of agricultural exports from the Midwest. SAY’S LAW: Foreign buyers need to raise money to buy US goods, and if their own sales have been taxed to minimal, they no longer can pay US farmers. How long will the Great Trump Depression last?